Title 14 of the Code of Federal Regulations (14 CFR) part 91, section 91.123 requires you to follow all ATC clearances and instructions. Request clarification if you are unsure of the clearance or instruction to be followed. If you are unfamiliar with the airport or unsure of a taxi route, ask ATC for a “progressive taxi.” Progressive taxi requires the controller to provide step-by-step taxi instructions. The final decision to act on ATC’s instruction rests with you. If you cannot safely comply with any of ATC’s instructions, inform them immediately by using the word “UNABLE.” There is nothing wrong with telling a controller that you are unable to safely comply with the clearance. Another way to mitigate the risk of runway incursions is to write down all taxi instructions as soon as they are received from ATC. [Figure 14-50] It is also helpful to monitor ATC clearances and instructions that are issued to other aircraft. You should be especially vigilant if another aircraft has a similar sounding call sign so there is no mistake about who ATC is contacting or to whom they are giving instructions and clearances. Figure 14-50. 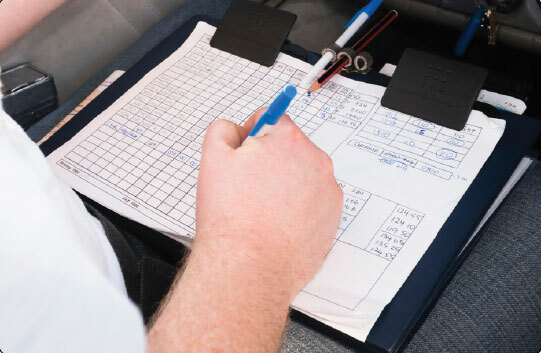 A sound practice is to write down taxi instructions from ATC. Read back your complete ATC clearance with your aircraft call sign. This gives ATC the opportunity to clarify any misunderstandings and ensure that instructions were given to the correct aircraft. If, at any time, there is uncertainty about any ATC instructions or clearances, ask ATC to “say again” or ask for progressive taxi instructions. The most important sign and marking on the airport is the hold sign and hold marking. These are located on a stub taxiway leading directly to a runway. 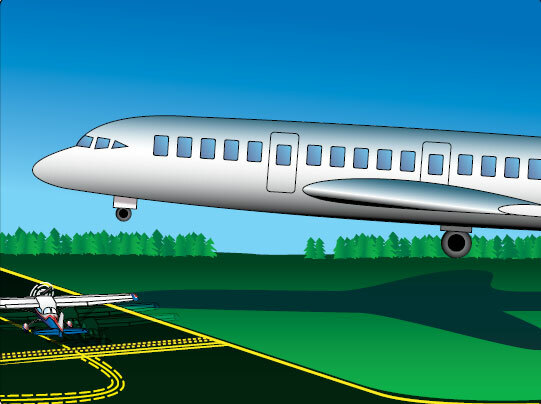 They depict the holding position or the location where the aircraft is to stop so as not to enter the runway environment. [Figure 14-51] For example, Figure 14-52 shows the holding position sign and marking for Runway 13 and Runway 31. Figure 14-51. Do NOT cross a runway holding position marking without ATC clearance. If the tower is closed or you are operating from a non-towered airport, check both directions for conflicting traffic before crossing the hold position marking. When ATC issues a “hold short” clearance, you are expected to taxi up to, but not cross any part of the runway holding marking. At a towered airport, runway hold markings should never be crossed without explicit ATC instructions. Do not enter a runway at a towered airport unless instructions are given from ATC to cross, takeoff from, or “line up and wait” on that specific runway. Figure 14-52. 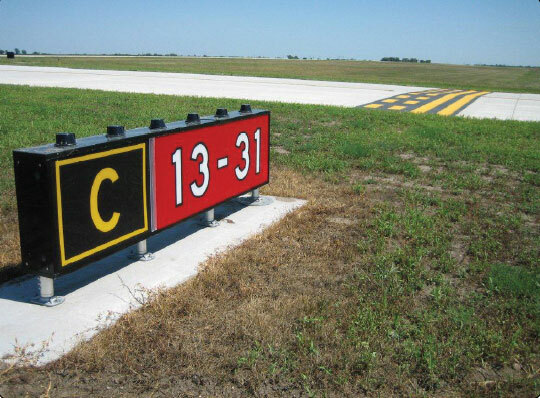 Runway 13-31 holding position sign and marking located on Taxiway Charlie. ATC is required to obtain a read-back from the pilot of all runway “hold short” instructions. Therefore, you must read back the entire clearance and “hold short” instruction, to include runway identifier and your call sign. 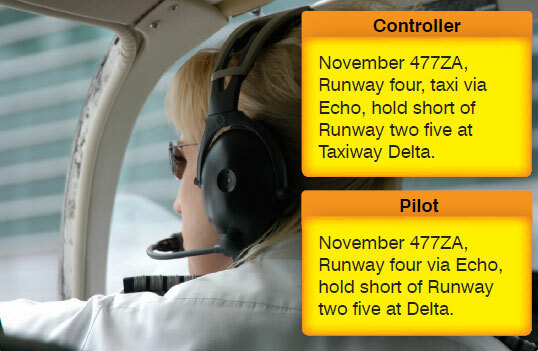 Figure 14-53 shows an example of a controller’s taxi and “hold short” instructions and the reply from the pilot. Figure 14-53. Example of taxi and “hold short” instructions from ATC to a pilot. 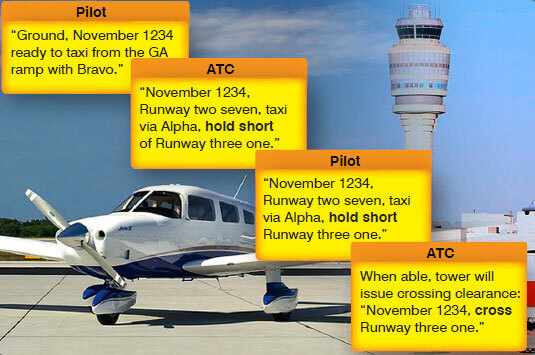 As of June 30, 2010, ATC is required to issue explicit instructions to “cross” or “hold short” of each runway. Instructions to “cross” a runway are normally issued one at a time, and an aircraft must have crossed the previous runway before another runway crossing is issued. Exceptions may apply for closely spaced runways that have less than 1,000 feet between centerlines. This applies to all runways to include active, inactive, or closed. Figure 14-54 shows communication between ATC and a pilot who is requesting a taxi clearance. Extra caution should be used when directed by ATC to taxi onto or across a runway, especially at night and during reduced visibility conditions. Always comply with “hold short” or crossing instructions when approaching an entrance to a runway. Scan the full length of the runway and the final approaches before entering or crossing any runway, even if ATC has issued a clearance. Figure 14-54. Communication between ATC and a pilot who is requesting taxi procedures. ATC now uses the “line up and wait” (LUAW) instruction when a takeoff clearance cannot be issued immediately due to traffic or other reasons. The words “line up and wait” have replaced “position and hold” in directing you to taxi onto a runway and await takeoff clearance. An ATC instruction to “line up and wait” is not a clearance for takeoff. It is only a clearance to enter the runway and hold in position for takeoff. Under LUAW phraseology, the controller states the aircraft call sign, departure runway, and “line up and wait.” Be aware that “traffic holding in position” will continue to be used to advise other aircraft that traffic has been authorized to line up and wait on an active runway. Pay close attention when instructed to “line up and wait,” especially at night or during periods of low visibility. Before entering the runway, remember to scan the full length of the runway and its approach end for other aircraft. There have been collisions and incidents involving aircraft instructed to “line up and wait” while ATC waits for the necessary conditions to issue a takeoff clearance. An OI caused a 737 to land on a runway occupied by a twin-engine turboprop. The turboprop was holding in position awaiting takeoff clearance. Upon landing, the 737 collided with the twin-engine turboprop. When ATC instructs you to “line up and wait,” they should advise you of any anticipated delay in receiving your takeoff clearance. Possible reasons for ATC takeoff clearance delays may include other aircraft landing and/or departing, wake turbulence, or traffic crossing an intersecting runway. If advised of a reason for the delay, or the reason is clearly visible, expect an imminent takeoff clearance once the reason is no longer an issue. If a takeoff clearance is not received within 90 seconds after receiving the “line up and wait” instruction, contact ATC immediately. When ATC issues “line up and wait” instructions and takeoff clearances from taxiway intersection, the taxiway designator is included. In some cases, where safety logic is being used, ATC is permitted to issue landing clearances with traffic in the LUAW position. Traffic information is issued to the landing traffic. Example – “N456HK, Runway One-Eight, cleared to land, traffic a DeHavilland Otter holding in position.” NOTE: ATC will/must issue a takeoff clearance to the traffic holding in position in sufficient time to ensure no conflict exists with landing aircraft. Prescribed runway separation must exist no later than when the landing aircraft crosses the threshold. You should review NOTAMs in your preflight planning to determine any airport changes that will affect your departure or arrival. When the available runway length has been temporarily or permanently shortened due to construction, the ATIS includes the words “warning” and “shortened” in the text of the message. For the duration of the construction when the runway is temporarily shortened, ATC will include the word “shortened” in their clearance instructions. Furthermore, the use of the term “full length” will not be used by ATC during this period of the construction. When an intersection departure is requested on a temporarily or permanently shortened runway during the construction, the remaining length of runway is included in the clearance. For example, “Runway three six at Echo, intersection departure, 5,600 feet available.” If following the construction, the runway is permanently shortened, ATC will include the word “shortened” until the Chart Supplement U.S. (formerly Airport/Facility Directory) is updated to include the permanent changes to the runway length. Are there any runway hold markings in close proximity to the exit taxiway? Do not cross any hold markings or exit onto any runways without ATC clearance. After landing, use the utmost caution where the exit taxiways intersect another runway, and do not exit onto another runway without ATC authorization. Do not accept last minute turnoff instructions from the control tower unless you clearly understand the instructions and are at a speed that ensures you can safely comply. Finally, after landing and upon exiting the runway, ensure your aircraft has completely crossed over the runway hold markings. Once all parts of the aircraft have crossed the runway holding position markings, you must hold unless further instructions have been issued by ATC. Do not initiate non-essential communications or actions until the aircraft has stopped and the brakes set.